Lentils with hard boiled eggs, tomatoes, avocado, a squeeze of lime juice, cilantro and a few dashes of hot sauce is a really simple meatless lunch I like to make for myself anytime I have cooked lentils (or sometimes I buy them cooked). 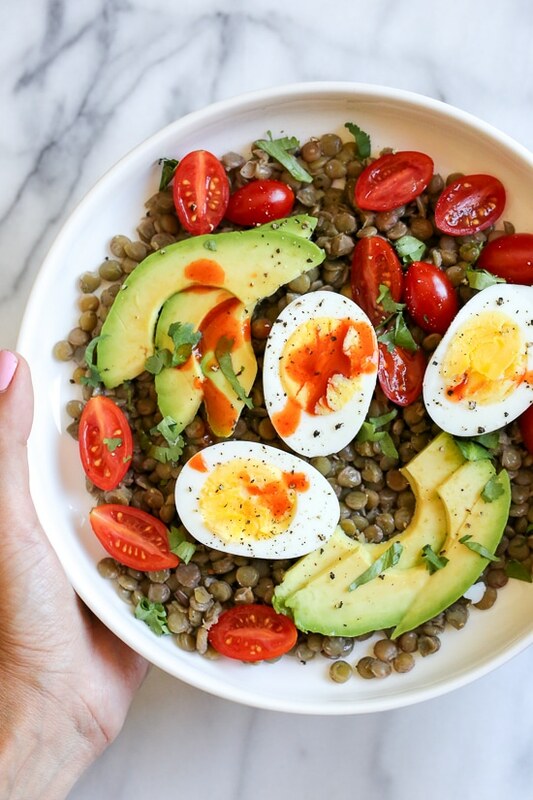 It’s also an easy dish to meal prep, you can make the eggs and lentils ahead if you’re cooking them yourself, and add the avocado and tomatoes the day you plan to eat it. To make prep even easier, make a batch of hard boiled eggs in your Instant Pot (affiliate link)! Instead Pot Hard Boiled Egg recipe here. If I buy my lentils precooked, they usually already come seasoned with salt, but if you make them yourself, be sure to add salt to them after. If you don’t like spicy food, you can skip the hot sauce, it will still be good! Pre-cooked lentils are usually found in the produce dept by the pre-cut veggies/lettuce or near the non-dairy proteins. They are sold under Trader Joe’s name and Melissa Produce. 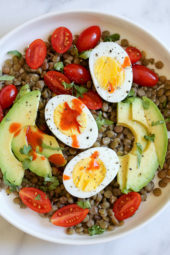 Place 3/4 cup lentils in a bowl, squeeze a little lime juice, salt and pepper over the top to taste and top with 3 egg halves, 1 ounce avocado, cilantro and finish with more salt and pepper. Finish with hot sauce and enjoy! I was slightly skeptical that this would fill me up, but it was absolutely perfect as a lunch. I was not hungry at all in the afternoon like I’d expected to be. I made it almost exactly as written, using canned cooked lentils to save some time. I also subbed in sriracha as I it had on hand. It was very tasty and objectively speaking very healthy. Quick to put together as well, if you use pre-cooked lentils. Kudos, Gina. I’ll be making this for lunches every so often. I had this for lunch and it was great. I’m six months pregnant with low blood sugar and this was a perfect choice. I cooked the lentils (brown /green) in the instant pot. (I did pot in pot, 1 cup rinsed but not soaked lentils, 1.5 -1.75 cups water, salt and black pepper in a glass bowl on the trivet, with two cups water in the pot liner for 8 minutes) I had sriracha with it. This recipe is amazing. So simple, delicious and filling. Hi, I have never made lentils before or seen them at the store. Can you tell us how to prepare them? Hey Gina! this looks amazing. Do you have a recipe for the lentils (I would rather make them at home than buy them) Thanks! I wasn’t sure I would like the flavor combination, but I was right to trust you, Gina! I misread the recipe and ate 1 1/2 cups lentils. But. Freestyle to the rescue! Also used only one egg,, just because. Loved the bright flavor of tomato. Also added a lot of cilantro, because I love it. Still learning to cook lentils to get the texture I want (cooked, but not mushy) but this was good anyway. Just cooked extra lentils for another day! This was surprisingly so Good! For as simple as it is! Great low point meal!! Am starting to use more lentils. Was a little unsure of this receipe. Am not real fond of avacado. Was happily suprised with the combination. Lime juice brings it all together. Will add to my lunch menu. So unique and deliciously filling! I have been making this for lunch for weeks and I love it. It is such an easy dish to make and during a busy week, it’s a life saver! Thank you for sharing this. 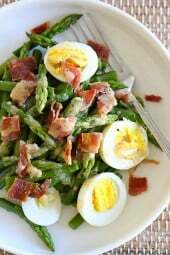 I really do like this salad, quite tasty and very filling. Will make often. This sounds delicious. i’m so glad that I found it on a search for things to do with cooked lentils. I bet that it would also be good with eggs dropped into the lentils and cooked in the oven for a few minutes. Thia was lunch today. The lentils were cooked in an electric pressure cooker with bay leaf, dehydrated onions and minced garlic. I did cook additional lentils to make this again this week. Delicious and filling. Absolutely delicious! 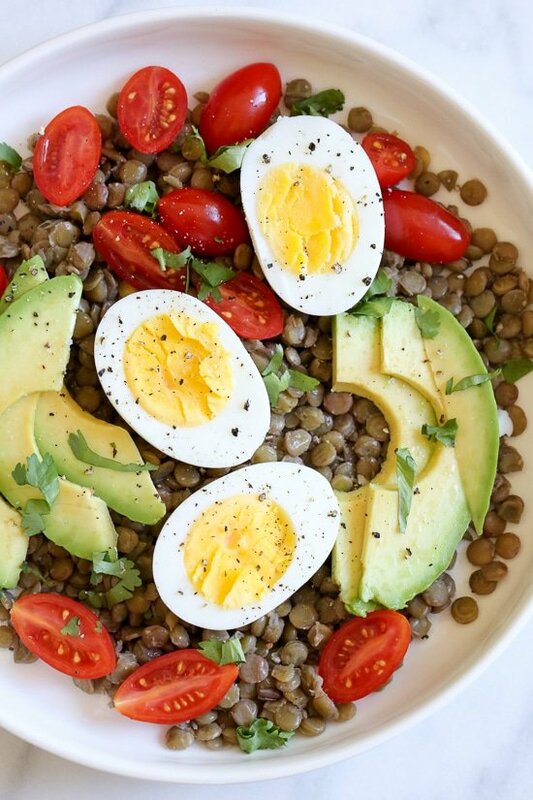 I would have never thought to put a hard boiled egg with lentils. I used siracha in place of the choula. I cooked 1 cup dry lentils in my aroma rice cooker with 2 2/3cups of water, 1tsp cumin, 2TB dried parsley, and salt and pepper. Set it to the white rice setting, stirred half way through and it came out perfect! I made is today with black beans instead of lentils. Very good! Love it! Thank you Gina for all that you do!PS- Any chance of also noting the Smart Point values of your recipes from the WW program prior to Freestyle too? Many of us still follow that…. Unfortunately I am only listing Freestyle and Points Plus points. How do you cook the lentils? So, to clarify it’s 347 calories for 1/2 the recipe? I used Trader Joe’s Whole Green Lentils and cooked them. When I calculate it I get 540 calories just for the 3/4 cup (1 serving) and not including the other items. Also when I search for green lentils in My Fitness Pal it also came up with the 540 calories. Can you let me know why this is so off from your nutritional facts calculation of only 347 calories per serving? Not sure why but when I calculate cooked green lentils in My Fitness Pal and from the calculations of the Trader Joe Small green lentils (cooked) they both equal 540 calories per 3/4 cup and that is not including all the other ingredients. You are getting 347 total calories per serving. Can you tell me why mine is so off? We did not add the lime, but instead added some traditional Indian spices to the lentils and I sprinkled just a tiny bit of Queso Fresco on top. I will absolutely be making this one again! I made these for lunches this week. I got the lentils from Trader Joe’s and substituted sriracha for the Cholula. Absolutely delicious and very filling! Eating right now and it’s fanfreakintastic. Do you think this might still taste good layered in a jar? This is sooooooooo good. I am eating it now for lunch. I have never eaten lentils in this way. I brought the pre-cooked lentils from Trader Joe’s and they are perfect for this and made the prep even easier for this dish. This is definitely on my rotation for lunch. I am so full off of this meal and it is delicious! The hot sauce added takes it over the top! Thank you Gina. Yes, I love their lentils! Glad you are enjoying it! This might be a silly question, but I guess this can be served hot or cold? How are you recommending it, Gina? Hi Gina. 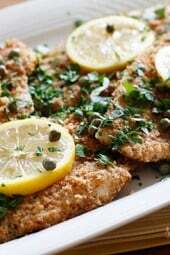 I love your recipes but have a question re nutrition breakdown. Why aren’t the saturated fats listed? I had this for breakfast instead of letting nch today. Never thought to pair my favorite egg sandwich ingredients with lentils. I especially want to thank you for making your recipes do easy to follow. I love how simple this is and can’t believe I never thought of it! I have all of the ingredients in my kitchen already, and I’m having this for lunch today! Thank you, Gina. I’m hypoglycemic but do well with lentils. I always have hard cook eggs and avocado on hand and the tomatoes are coming in like crazy. This is great to get away from my basic salads. Since I have to have a higher amount of fat I am going to marinate the lentils in olive oil and lime juice first. I joined WW 3 months ago and have been successful so far. But I ran out of ideas of food to eat that was real. I don’t like all the fake food filled with chemicals (low fat this, no fat that–salad dressings are the worst). My WW leader told us about your site. I was thrilled with what I found! I just received my order of your cookbook and I am so excited to start reading and cooking. Thanks for including WW smart points. This recipe post was a joke, right? Rude! Why is it a joke? Only thing here that is points on WW is the avocado yet its packed with protien. 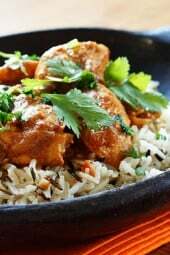 Recipes dont have to complicated or even require skill or cooking. This site specifically focuses on losing weight AND works with WW. This is a simple recipe that someone can pack for lunch. Oh my goodness. This recipe looks amazing. Might have to be my go-to lunch for next week!